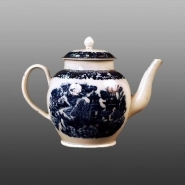 The opposite side of the teapot is printed in blue with the Conversation pattern. A pearlware globular shaped teapot printed in blue with a line engraved Conversation pattern and with the addition of painted floral sprays. The painted inscription on one side reads "Mary Lee Born July 19 1787 / Millton Oxfordshire / When This you see / Remember me Through / Many Miles Wee Distant / Bee". The reverse side is printed with the full Conversation pattern (see below).